A lot of people were saying they wanted to make the Go Team mittens for a husband or father. Since I was knitting a pair for my husband, I thought I’d share the larger men’s pattern. 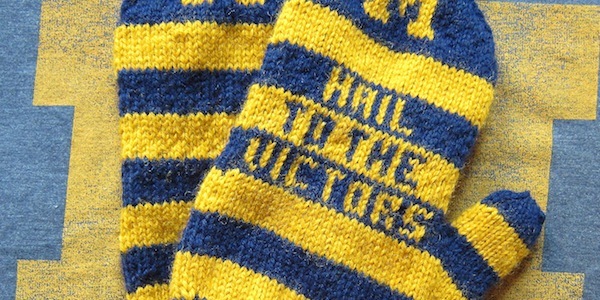 Also a new design for University of Michigan mittens. 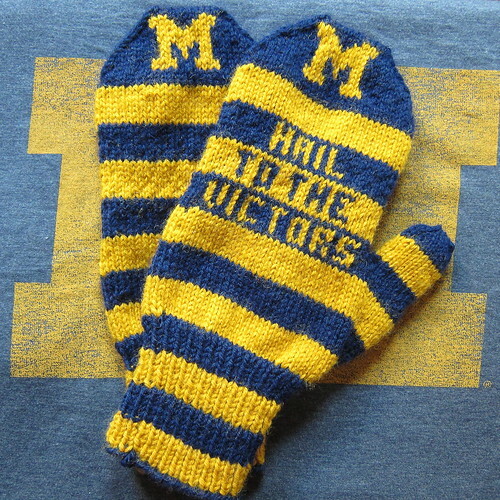 Once again I am giving you two charts for this pattern, the Hail to the Victors chart and a men’s blank chart for you to design your own or add the charts from the Women’s Go Team Mittens. Makes mittens that are 9 1/2 inches around and 8 1/2 long (not including the cuff). They can easily be made shorter or longer by adding or subtracting a few rows. To make them wider cast on more stitches and adjust your decreases at the end. Update 1/8/13: A few people have written me lately asking if I did the colorwork as I went along or if it was duplicate stitch. I did it as I went along. I carried the yarn, twisting it every 3 stitches so there weren’t long floats. You coud easily do this as duplicate stitch if you preferred though. Cast on 56 stitches. Divide between 3 needles. Join together to form a circle being careful not to twist the stitches. Place a marker to mark the end of the rounds. Place the first 11 stitches on one needles and the second 11 on another. Join together using the Kitchner stitch. Put the 21 stitches on the scrap yarn on three needles. You can finish the top of the thumb either with kitchner stitch or by running the tail through all 8 stitches and pulling tightly. Do not sell, duplicate for distribution or teach this pattern without permission. 7 years ago by Kat in Knitting , Knitting Projects , Needlecraft , Projects | You can follow any responses to this entry through the RSS feed. You can leave a response, or trackback from your own site. CUTE!!! Any chance you’ll be listing them on Ravelry? Please let me know which is correct. Good catch. The first “16” should have actually said “15.” I must have just mistyped since it went 14, 16, 16. It is fixed now. Should Row 29-54 be Row 28-54? Should Row 17 actually be Row 13? I have no idea what I was doing when I did that numbering. Think the problem is I used the Women’s pattern & just changed that numbering. That’ll teach me to take a short cut. On the first one you are right, it should be 28-54.
and then the remaining rows are 16 & 17. I have fixed the pattern in the post.